Coming from a strong sporting background in field hockey and tennis, early on, it was clear for Roberto that his professional life would be spent in the area of sports one way or another. After hanging up his competitive training boots he moved to the UK from his native area the Black Forest in Germany to pursue a career in the fitness industry. Working as a personal trainer for many high end clubs in London he developed his unique way of connecting with his clientele and helping them achieve their personal fitness goals using a multitude of strength and conditioning principles. It was in 2010 that Roberto entered the boutique fitness domain when joining Heartcore Fitness. After being introduced to the dynamic Pilates Heartcore method by Jess Schuring, the founder he immediately recognised the power of this amazing training style and the benefits it offered for a multitude of clients. Roberto spent the last 8 years with Heartcore in London where he was an integral part of the business from training his loyal client base, managing the Chelsea studio to creating the TRX programme in his early conception. After all this time spent in the “heat” of London...it was time for him and his family to look for a new and a sunnier location to continue his efforts in helping people achieve their personal fitness aspirations as well as allowing him to open a studio where he could implement his carefully crafted training style. This is where Roberto and the founders came up with and developed the idea of Reform Athletica - a very passionate approach to bringing effective group training techniques as well as quality coaching and an overall balanced wellness approach to the developing Dubai fitness scene - Having spent a big part of his career in group and personal training environments, for Roberto it is all about the meaningful connections and relationships that he forms as well as delivering an exceptional experience that keep his passion going strong. You will find him heading up the training team at Reform Athletica doing what he does best...’sharing some tough love’ ! Born and raised in South Wales, UK. Louise has always led a very active lifestyle and her main hobbies as a child included dance, music and drama. At 18 Louise left home to pursue a career in dancing and gained the opportunity to travel around the world working on Cruise Ships. Wanting more of a stable lifestyle with the ability to travel as well, Louise came to Dubai to pursue her career in the fitness industry. Louise is a qualified PT and is a qualified matt and reformer Pilates, Barre and megaformer trainer. Louise loves helping people achieve their fitness goals and is thrilled to be part of the team to make this possible at Reform Athletica. You can catch her teaching the Reform Method or TRX Athletica. With a background in STOTT Pilates (Pre/ Post Natal) and Personal Training, Sarah is passionate about all things sport. 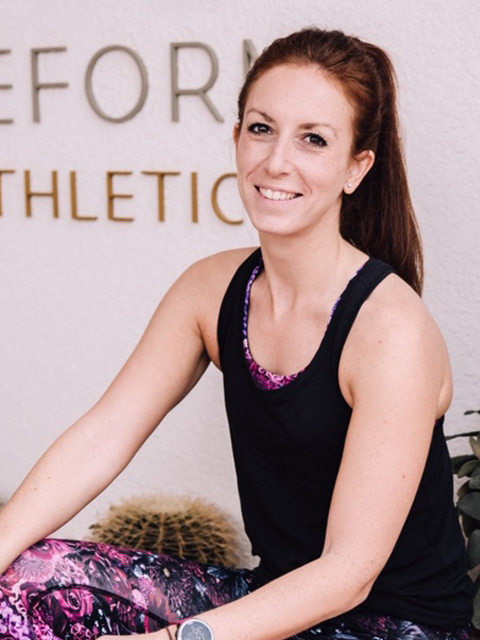 With a background in STOTT Pilates (Pre/ Post Natal) and Personal Training, Sarah is passionate about all things sport, and believes in a holistic approach to fitness - exemplified by her personal workouts which merge the principles of Pilates with swimming and HIIT training. Sarah advocates the feel-good factor when it comes to fitness, and while it will be a challenge, it should also be good fun - the more you enjoy a style of working out, the more you will do it and therefore benefit from it! Growing up as a dancer, Laura found her way back to movement through yoga in 2015. Growing up as a dancer, Laura found her way back to movement through yoga in 2015. What started as a means to stretch out her body as a runner at the time, turned into a way of life. Laura is very passionate about combining the strength aspect to ones mobility practice to in turn move with grace and control through movement. In 2016 she received her 200 hr YTT Certification in Singapore and went on to further her teacher qualifications in Bali where she became certified to teach pre and postnatal yoga. She recently returned from a mixed movement arts course at Budokon, Miami wherein she became certified to teach Budokon yoga and mobility. Her classes focus not only on opening up the body through deep stretches but also on building strength through the transitions between each pose. Mariam has a background in dancing and has an avid love and dedication to her Crossfit journey. Her fitness journey started when she was invited to the Spartan Race in 2015. From there on, she fell in love with CrossFit and for Mariam, it became a way of life. It gave her not just physical strength but mental and physiological. She found a community with like minded people thriving to be the best versions of themselves.